Meet GPA-WI superstars Gary and Cheryl Suckow from Germantown! The Suckows have shown their commitment to greyhound adoption by fostering, donating and volunteering for GPA-WI. Retired from their jobs as a printer and retail manager, Gary and Cheryl entered the world of greyhound adoption in 2013 when they adopted their first two greyhounds, black boy Daryl and cowdog Dolan. Since Daryl and Dolan, the Suckows have owned four greyhounds. “The hounds are just love. You love them, and they love you. The only bad day they are going to give you is the day they pass away,” said Gary. From Percy the cowdog to Bella the brindle to Redd the fawn, the Suckows are familiar with nearly GPA-WI greyhound that’s been adopted since April 2017. Through their volunteer hours spent at the kennel, with foster dogs and with dog-sitting, the Suckows have provided care in some way, shape or form to nearly every greyhound in GPA-WI’s program. At GPA-WI kennel days in Burlington every two weeks, the Suckows help walk, bathe and care for dogs. When a new haul of greyhounds arrives in Wisconsin, the Suckows are ready and waiting to help unload dogs from the truck — even at odd times like the wee hours of the morning or late at night. And when a recently adopted greyhound is ready for a two-week foster stay to transition to home life, the Suckows open up their home to foster. The Suckows have fostered 32 dogs total since they began fostering in 2017. On top of these efforts, Cheryl also helps to show available dogs to potential adopters, and Gary provides assistance with medical-related needs at the kennel, like removing sutures and administering medications. The Suckows also lend a helping hand to ensure that many GPA-WI adoptions run smoothly: Cheryl participates in home visits with adoptions in the Milwaukee area, and they frequently host greyhound playdates at their home with newly adopted hounds. 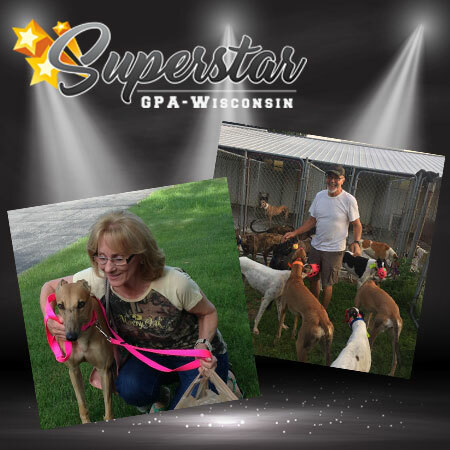 Furthermore, Gary and Cheryl have not only taken in — but have adopted — two surrendered greyhounds that were returned to GPA-WI. Dorothy the greyhound was surrendered due to her owner’s passing, and Starz was surrendered when her owner relocated and could not keep her. “When they come in your door and look at you, you know they just want a chance to love you. Some have been bounced around, and they are usually the best dogs. Some of these dogs are in their forever homes for only a week — one was even one day, and you know it’s not the dog, but the people. There are no bad dogs; only bad owners,” the Suckows said. In addition to their time helping greyhounds and GPA-WI as an organization, the Suckows have donated generously to GPA-WI. While the Suckows frequently dog-sit at their home, they donate their dog-sitting fees back to GPA-WI and have contributed more than $2,000 to GPA-WI this year. “Oh, and the reason we donate the dog-sitting money to GPA-WI is because I don’t want to have to pay taxes on it. This way, the government won’t get me,” Gary said. And thank you, Gary and Cheryl, for your generous donations of time and money toward the mission of Greyhound Pets of America-Wisconsin … your efforts are the embodiment of a GPA-WI Superstar!